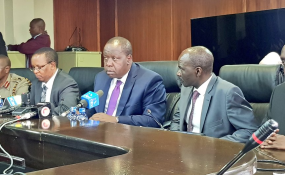 Cabinet Secretary Fred Matiang'i speaking before the parliamentary committee that oversees the Interior ministry. Deported lawyer Miguna Miguna may have returned safely to his Canadian home, but the drama surrounding his failed entry into Kenya last week could come back to haunt him. Kenya and the United Arab Emirates are said to be keen on establishing how the lawyer got the Canadian passport that enabled him to travel from Dubai to Toronto on Monday, yet the document had been reported in court last week to have been lost. Though no investigations have been launched, the passport riddle could open a new battlefront between Miguna, who arrived in Toronto (at midday, Kenyan time) after a 13-hours and 25 minutes flight aboard Air Canada 57 (ACA57), his lawyers and the State. If it is found that the passport was not lost as alleged in court papers, Dr Miguna could be wanted for perjury when he sets foot in Kenya. Under Kenya law, giving false information in a court attracts a maximum jail sentence of seven years with no option of a fine. "We are trying to establish how he got the passport for onward travel since it is on record even in court that it was lost," Interior ministry spokesman Mwenda Njoka said on Monday. An affidavit sworn by lawyer Nelson Havi after Dr Miguna's failed re-deportation last week said Mr Miguna did not have the passport. "The respondents (government) have unlawfully seized the petitioner (Mr Miguna's) Canadian passport in a clear attempt to have him declared stateless and continue to violate his fundamental rights," Mr Havi said in an affidavit dated March 27 in a case that sought Dr Miguna's release from detention at the Jomo Kenyatta International Airport (JKIA). On Monday, lawyer Cliff Ombeta, who also represented Dr Miguna, insisted that the legal team's position was that the passport had been snatched from Dr Miguna at JKIA. "He does not have the passport. When he was being forced to the plane on Monday night, it was missing," Mr Ombeta said, adding, "This thing that the lawyers had the document and that I sneaked it to him in Dubai, is just not true." Immigration officials said they had to retrieve details of his passport from the system on Wednesday to enable his eventual deportation to Dubai, suggesting that he still did not have a travel document. During the failed deportation bid on Monday night, hours after he arrived, various sources suggested Dr Miguna had given his passport to one of his lawyers for safe keeping after he refused to have it stamped for his entry into Kenya. After his deportation on Wednesday, there were claims that Canadian officials had processed new travel papers for him. Immigration officials, however, said this was unlikely because replacements are only made when the originals are lost and after due process. That has left a possibility that the passport was actually taken to Dr Miguna in Dubai by an emissary. Kenya government officials believe Dr Miguna had given the passport to one of his lawyers. They also said the passport was an issue of investigation in Dubai though no formal inquiry had been made through the Foreign Affairs ministry. In a statement yesterday, Dr Miguna downplayed the questions surrounding his travel documents. "On March 28, I was assaulted, drugged and forced out of Kenya unconscious," Dr Miguna declared in the statement minutes after he landed. "The issue here is not how I have travelled to get medical treatment or on what passport. The issue is my abduction, assault, drugging and forceful removal by a rogue regime in defiance of more than 10 court orders!" He said that he had refused to use or hand over his Canadian document "because I arrived in Kenya on March 26 as a Kenyan born citizen." "After my medical treatment abroad, I intend to immediately return to Kenya and to continue with the struggle for a better and just society that we Kenyans have been yearning for 55 years!" Meanwhile, the parliamentary committee that oversees the Interior ministry is on Tuesday scheduled to meet Interior Cabinet Secretary, the Inspector General of Police and Principal Secretaries in the ministry on the denial of entry, mistreatment and deportation of Dr Miguna.